If I have understood you all correctly, I'll go ahead and post this in the 2600 forum, with all the rules! I enjoy the Atari 2600 because it is very well engineered. The 6502 processor has a wonderful instruction set, and the TIA is an ingenious solution to drawing video graphics with such a small number of transistors. I have been developing video games in the Unity game engine, which uses a high level language called C#, and it is fun to do incredible things with so few lines of code, but it honestly doesn't feel special. I spend a lot of time on the Atari because it has such a big community. I know Unity also has a community, but it's much more corporate. For me, the Atari 2600 /is/ a challenge, but I don't develop almost exclusively on it because it is such a challenge. For instance I am very annoyed that the system only has 128 bytes of RAM, and there are only 76 CPU clock cycles per scanline. I am also very frustrated that the maximum size your cartridge banks can be are 4 kilobytes. If the 2600 had a faster processor, more RAM, and a bigger address space, I honestly don't think I'd ever leave it. The fact it only has 2 hardware sprites is not an issue for me. I find modern consoles and platforms to be very unparsimonious and inefficient with their resources and architectures. Like Hennessey and Patterson (?) of the RISC-V processor foundation say, right now, because Moore's Law doesn't apply anymore, we have to return to a lot of the design priorities that were manifested in computer systems like the Atari 2600 which are Domain Specific - they have a very specialised architecture which does a small number of things /very well/. I suppose that's the reason why the 2600 is so special to me. It only tries to do one thing very well, and it really succeeds at that. The more I work on the 2600, the more beautiful I think it is. It's so easy to use and its architecture helps you achieve what you want to do. I feel like the dawn of the era of the minicomputer, say, the mid-1960s, up until say... the early 1980s is my favourite era of engineering, both at the mainframe/minicomputer and microcomputer level. There are so many beautiful processors and computer architectures that were realised during that time. The DEC minicomputers like the PDP-8 and PDP-11, the Commodore VIC-20 and Commodore 64, the Atari 2600, and the Z80 processor, as well as the Motorola 680X series of microprocessors were all such beautiful beautiful inventions. I look at processors today and they're just churned out for making money instead of being carefully and beautifully engineered. I also like the education and 'hope' for computers that characterise the culture of the mid-60s to early-80s. You had to prosecute an /argument/ for the introduction of computers into everyday life, and it wasn't always taken for granted (why get the newest phone? Honestly: why?). Entire documentaries and TV series were invented for explaining the purpose and need for computers, and a lot of this culture was reflected in the applications towards which computers were put, like the Atari 2600. We have none of that now. I feel very passionately about the Atari 2600, but I still haven't really discovered the /essence/ of that passion, so I'm still working away at my stupid game, and maybe the next game, until I really try and grasp the core of what is driving me. I put a couple hours in today. We are now very close to having a playable demo of the 256x256 overworld you can move around in. I have not compiled and run my code, and I suspect it current DOES NOT work, but I am uploading it in any case. True - I'd like people to understand what they're doing, though. Batari BASIC really is a great way to get going really quickly, though. Most programming now is all about doing the most you can in the minimum amount of lines. Assembly is NOTHING like that. I'm actually thinking of doing some YouTube videos on how to learn 6502 assembly for making 2600 games. In my experience, I don't think 6502 assembly is that difficult. Most of the time you're just storing, loading, and branching. It's not that hard. Anyway some lectures/tutorials would easily help more people grasp the concepts. I think it's possible - the idea just dawned on me, though. People have already written compilers for brainfuck, and have done it in around 1KB. I suppose I would just have to reimplement their sourcecode. I think I would perhaps implement the 7-bit ASCII character set, but that would take up room. Perhaps I could go with a 5-bit character set, and forego lower case characters. The main problem is having enough RAM. Writing brainfuck as an interpreter would take up RAM, and writing a compiler would require the 2600 to /write/ the program somewhere on the cart, and that may be possible with some extra bankswitched SRAM or some sort of non-volatile RAM? Anyway I just wanted to bring this idea I had up to see if anyone found it interesting. I've done some googling, and it is possible. I also know you can do self modifying code - changing the code in RAM and /then/ executing it. I think the general idea is to point the program counter to the address locations in RAM. So you'd need to set RORG to somewhere between the beginning of RAM ($80) and the end of RAM, I think. I AM DEDICATING TIME TO THIS TODAY. I am making the world procedurally generated. It is what I really and actually want to do. i have designed the overworld. it is 171 screens. i think a 32KB cartridge will have enough space to store all the information for this. there are bosses and mini bosses. 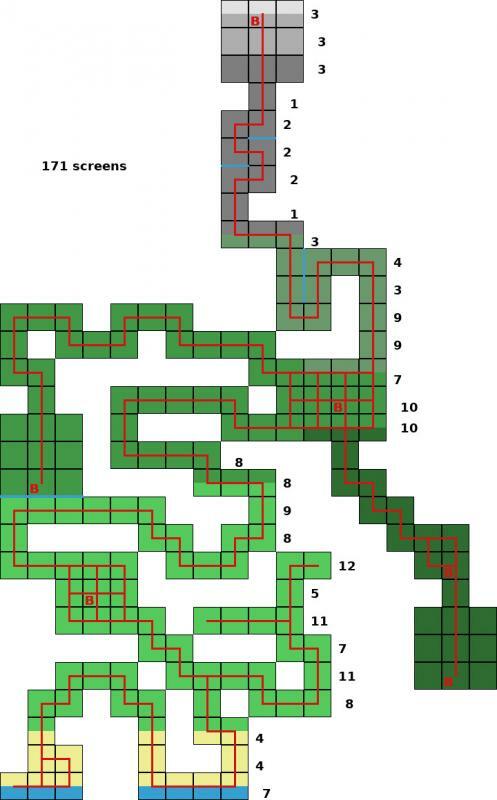 you will have to defeat a boss in order to unlock another area - i imagine to get to the mountain summit, you will have 2 boss areas accessible, and you will have to defeat both in any order in order to get to the final area. i think i will draw up the code and the lookup table for each screen on another day.